From 1974 to 1981, he was the editor and managing editor of The Australian Financial Review and then established Nine Network’s Sunday program. In 1983, he was made a member of the Order of Australia for his services to journalism. Max then became co-presenter of the Carleton-Walsh Report on the ABC before moving to Channel 10 as anchor for The Walsh Report. From 1983 to 1998, Max was also a columnist and correspondent with The Sydney Morning Herald and The Age in Melbourne, and in 1998 he became the Editor-in-Chief of The Bulletin. He worked at The Bulletin until his recent retirement from the Editor-at-Large position in June 2007. Max joined Dixon Advisory as Deputy Chairman in July 2007 and retired in June 2017. 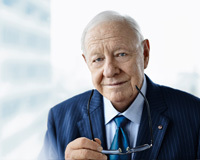 Throughout his tenure, Max applied his wealth of experience to provide insights on the economic and political situation in Australia and worldwide.